Cox Sales & Service Inc. provides the best in new shopping carts, reconditioned used shopping carts, 1st quality hand baskets, and a complete line of backroom equipment. 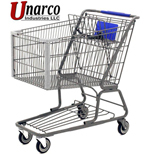 As a full service company, Cox Sales stocks a complete line of new shopping cart parts for immediate shipping. Contact us today for all your equipment needs!